Nocturnes – 24 Nocturnes for Solo Guitar is the latest publication of works by composer Nick Peros, published by Les Productions d’OZ. These 24 Nocturnes for Solo Guitar by composer Nick Peros are perhaps the most expansive collection written for the instrument and showcase the guitar as an instrument perfectly suited for the form. 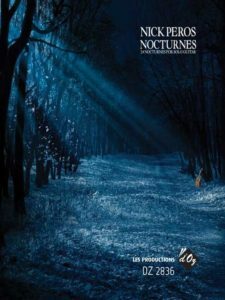 The publication of the complete score by publisher Les Productions d’OZ helps to lay an important foundation for the guitar as an eminent instrument for the modern nocturne form. “There is not a large repertoire of nocturnes for guitar, so Peros’s are doubly welcome. The number 24 is canonical in classical music. Think of one book of Bach’s Well Tempered Clavier or of Chopin’s Preludes. As a cycle, Peros’s nocturnes hold together through a true exploration of night feeling and atmosphere. These are genuine nocturnes that the inventor of the genre, John Field, would have recognized as such … One is swept away by Peros’s subtle handling of his thematic material. Also, the music is very idiomatic for the guitar, with effects that are lush and tender without being overly fussy … The music carries you away to other times and places. It’s a journey worth taking. The first nocturne, marked “with fire and passion,” pays homage to the Spanish guitar tradition. “Gentle, dreamy,” the third nocturne harks back to the 19th Century image of someone sitting at a window at night by candlelight. No. 4 is technically challenging, and beautifully played by Kolk. No. 6, marked “atmospheric, mysterious,” is like a winter scene, with a real chill in the air. “Gentle, tender,” No. 8 is like a reminiscence of a childhood home long gone. No. 10, “with rubato and intensity,” is a stylistic challenge ... No. 12, “with expression,” is sort of an elegy, with the deceased’s personality being quite palpable. “With restrained passion,” No. 14 is a feast of color. No. 15, “as a dream,” is diaphanous in texture. No. 16 has a lovely, lyrical dimension, like an Aeolian harp … No. 21 is another Latin-influenced piece, especially in its darkness. With its ostinato, the “gentle, tender” No. 23 is Peros’s answer to Chopin’s “Raindrop” Prelude. No. 24 is a little reminiscent of Bach’s “Sheep May Safely Graze,” an evocation that is a suitable ending for the cycle.